In many ways, I am very tech-savvy, but in other ways, I’m an old-fashioned girl. So when e-readers came out a few years ago, I was not the least bit interested. I love books. I love the look of them and the feel of them. I love bookstores and libraries. The idea of reading a book on a skinny, slick device did not appeal to me. But over time, I found that I was not reading that much, even though I have a shelf full of books I want to read. I travel to my clients on buses and subways, and books are heavy. So I was not taking advantage of what would have been ideal reading time for me. Earlier this month, I borrowed my teenage daughter’s Nook to try it out. I loved it! It could be easily slipped into my bag without adding much bulk or weight. I sped through one book, then another, then I read the entire Hunger Games trilogy in less than a week. I was ready to graduate to an e-reader of my own. 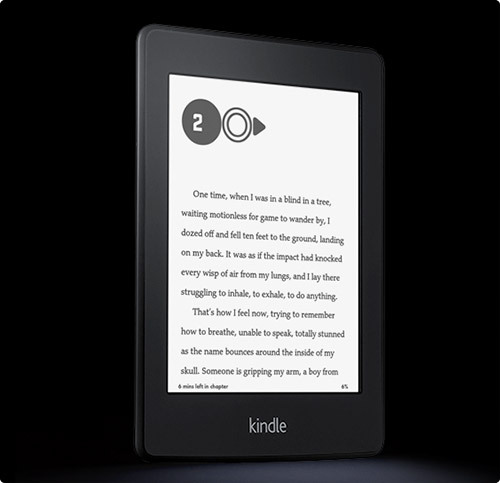 Last week I became the owner of a Kindle Paperwhite, the latest and greatest in Amazon’s fleet of e-readers. I have come to realize that it is a great organizing tool. Here are some of the reasons why. Much as I love books, buying books always bothered me because after I read them, they were still there, taking up space. I usually give away or donate a book afterward I read it. But e-books are clutter-free! And they cost less than physical books. If you are a book lover, you probably keep lists of books that you want to read. With the Kindle, if I hear about a book that interests me, I can find it on Amazon and download a free sample. When I’m ready to look at it more closely, I can read it to see what I think. Then if I decide to buy it, I can have the entire book on my Kindle in just a few clicks. Downloading free book samples is more efficient than keeping lists of books, and being able to obtain it at the exact moment when I’m ready to read it is good time management. I grew up patronizing the local library – another clutter-free way to enjoy books, because you give them back after you read them. I was thrilled when the New York Public Library system went on-line, as I could arrange to have a book sent to my local library for pickup. The downside was that I had to wait, and sometimes the book would be ready for me when I was too busy to read it. So I am really enjoying the ability to purchase and download a book instantaneously – more good time management! (The NYPL has e-books for borrowing, but I haven’t tried this service yet). As you can tell, I’m excited about the world that has just opened up to me. While the expression “So many books, so little time” still speaks to me, I feel that I’ve gotten a little closer to solving that dilemma. And found a handy new organizing tool as well! Sharon, we’re kindred spirits! I love your point about downloading free samples of books, rather than keeping a list. I hadn’t actually thought of that. Brilliant!